5 Ways to Increase Your Best Leads: Customer Referrals - Gordon L. Johnson, Inc. It doesn’t take long to learn that your best leads are referrals. When one of your clients refers you to a colleague, they’re usually doing it because there’s a real opportunity there. Also, their colleague’s company is usually similar to theirs –same size, similar culture, and usually needs the same types of solution. Now that’s targeted marketing! When you are planning to make a large purchase — a car for example — you may read car magazines and company brochures and talk to salespeople, but what really leads you to your ultimate choice? Often, it’s a trusted friend who owns a car you’re considering and is willing to personally vouch for it. That’s the power of referrals. They often overcome all other product research. Unfortunately, referrals can be hard to come by, unlike the leads that you get from email blasts and direct marketing programs. As marketers, we wish we could simply move marketing funds into referral-generating campaigns, but it rarely works out that way. Referrals simply aren’t as scalable. Still, experience has taught me there are few ways to double or triple your referrals. Happy clients love to give referrals, but don’t always remember you when the time is right. That’s why you should let them know how important they are and show appreciation for them. Look for advocates who are already talking about your quality services to others. A huge company I do business with built their marketing program almost entirely around generating referrals. Every email that they send to customers end with, “Who is the one person you know that could benefit from my advice and expertise?” You can re-purpose this message for your customers and make it a part of your salespeople’s standard email signature. Your salespeople almost certainly know Idea #1: Ask for referrals all the time. But are they actually doing it? Most salespeople tell me they either forget or are too uncomfortable to ask. Help them develop the habit so it becomes second nature. Buy one get one at half price” is a common marketing promotion in many industries. Why? It works. In service industries, such as training, what you’re really asking for is a client referral. When a customer registers for a class or buys other training products, make it worth their while to encourage a colleague to do the same. Offer a discount on the current product or a future product as an incentive. If they can’t think of anyone else who could benefit from your services, remind them to consider other departments in their company or their vendors, partners, or clients that may want to reward. Everyone wins from this. Your client gets a discount and you get a new customer. One company I worked with met with each of their major customers annually to present a thorough report of what the customer purchased in the previous year to ascertain what their goals were for the upcoming year. In each of these meetings, we encouraged referrals because it would increase their discount and their purchasing power. We told the customer that if we could get one more department in their organization to spend the same amount, we would give their company a major price break. Often, this led to deep discussions about the company’s org chart and who the best contacts are. Some clients even went so far as to give us an org chart and a phone list! I once read a study that found that satisfied customers tell one person about their experiences with a company, while unsatisfied customers tell five. There’s a lot of power in referrals, for good and for bad. Obviously you want your advocates to outnumber those who are saying bad things. This seems to be a no-brainer, but it’s amazing how easily it can be forgotten, especially with those who aren’t on the front lines with customers. Early in my marketing career, I thought the number of customers who bought my companies’ product was directly related to the success of my carefully orchestrated marketing campaigns. Over the years, I was curious about the number of new customers who came out of nowhere. Where do they all come from? Salespeople didn’t get them to reach out. Marketing didn’t do anything to get them. So, what happened? After talking to hundreds of customers, I finally concluded that more came from referrals than from marketing or sales activities. If you don’t currently include referral-generation in your marketing plan, the time to include it is now. 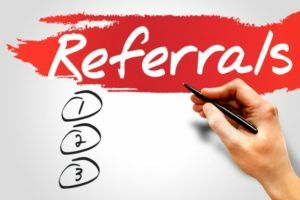 If you already have a plan for generating referrals, the ideas above should help you freshen up your approach. 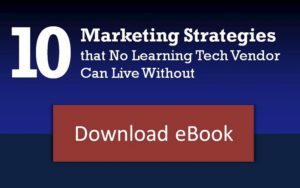 If you enjoyed this post, check out our eBook 10 Marketing Strategies That No Learning Tech Vendor Can Live Without. About Gordon L. Johnson: I’ve been a marketing leader in the corporate L&D industry for over twenty years with the last ten years focused on learning technology. Along the way, I’ve discovered what works — and what doesn’t. More info at www.gordonljohnson.com.